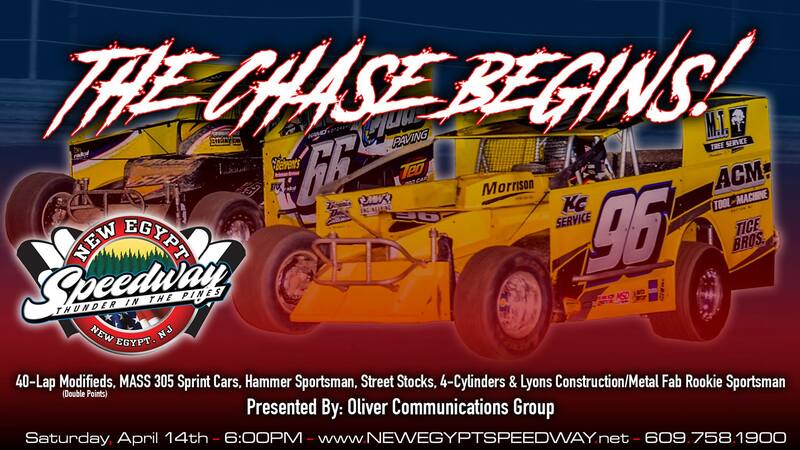 New Egypt, NJ – Points races begin this coming Saturday night April 14th when Oliver Communications Group presents Opening Day at New Egypt Speedway. The Modifieds will be the headline division with a 40-Lap double points affair paying $2,750 to win, also in action will be the Mid Atlantic 305 Sprint Car Series, Hammer Sportsman, Street Stocks, the debut of the 4-Cylinder’s and the Lyons Construction/Metal Fab Rookie Sportsman. Pit Gates will open at 3PM, Spectator Gates will open at 4PM with Hot-Laps being scheduled for 5PM and Racing beginning at 6PM. Admission to the grandstand is $22 for adults, $20 for seniors 65 and older, $10 for teens 12-15, $10 for military personnel and their spouses with ID, and Kids 11 & Under are FREE. Pit admission is $30 with a New Egypt Speedway license and $40 with no license. A free-to-the-public Open Practice will be held on Thursday night April 12th from 5-9PM with the Pit Gates opening at 3PM, any racecar that is New Jersey legal is welcome to take part in the practice session. Pit Admission will be $25. New Egypt Speedway is located on Route 539 in New Egypt, NJ just minutes from Six Flags Great Adventure and the New Jersey Turnpike. A racy 7/16-mile D-shaped dirt oval, New Egypt Speedway serves Garden State race fans with some of the best competition in the country. New Egypt’s state-of-the-art facilities feature daylight-quality lighting and excellent sightlines from any seat in the house. The grandstands are fully wheelchair accessible with wide, clear, and well-groomed walkways. Concession facilities serve up everything from Jersey Burgers to ice cream treats at family-friendly prices. New Egypt, NJ – New Egypt Speedway has been forced to postpone its opening weekend scheduled for Friday and Saturday April 6th and 7th due to the facility grounds still being wet from the winter. The free-to-the-public Open Practice session has been rescheduled for Thursday night April 12th. Pit gates will open at 3PM for inspection and practice will run from 5-9PM. Any racecar that is New Jersey legal is welcome to take part in the practice session. Pit Admission will be $25. Then on Saturday night April 14th New Egypt Speedway will fire-off its 21st Season as a dirt track when Oliver Communications Group presents the return of the Modifieds who will compete in a 40-Lap, $2,750 to win, Double Points affair along with the Mid Atlantic 305 Sprint Cars, Hammer Sportsman, Street Stocks, 4-Cylinders and Lyons Construction/Metal Fab Rookie Sportsman. Pit Gates will open at 3PM on April 7th, Spectator Gates will open at 4PM, Hot-Laps will hit the speedway at 5PM and the first green-flag of 2018 is scheduled to fly at 6PM. Admission to the grandstand is $22 for adults, $20 for seniors 65 and older, $10 for teens 12-15, $10 for military personal and their spouses with ID, and Kids 11 & Under are FREE. Pit admission is $30 with a New Egypt Speedway license and $40 with no license. New Egypt, NJ – Due to moisture left over from back-to-back Nor’easter’s New Egypt Speedway has been forced to postpone its Open Practice until Friday night April 6th. Pit gates will open at 3PM for inspection and practice will run from 5-9PM. Any racecar that is New Jersey legal is welcome to take part in the practice session. Pit Admission will be $25. Opening night re-draw positions will still be up for grabs. The following night New Egypt Speedway will fire-off its 21st Season as a dirt track on Saturday April 7th when Oliver Communications Group presents the return of the Modifieds who will compete in a 40-Lap, $2,750 to win, Double Points affair along with the Larry’s Hot Rods & Harley’s Northeast Wingless Sprint Cars, Hammer Sportsman, Crate Modifieds and Lyons Construction/Metal Fab Rookie Sportsman. New Egypt, NJ – Mother Nature certainly hasn't been a race fan the past couple weeks. 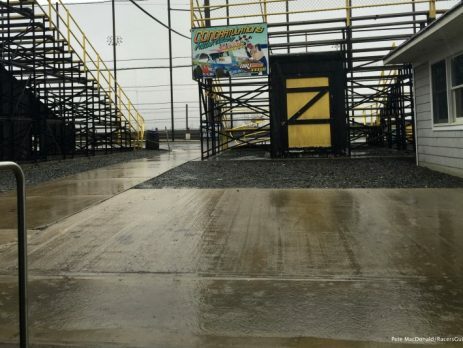 Multiple Nor'easter storms have left the New Egypt Speedway grounds saturated forcing the Ocean County D-Shaped oval to cancel the March Meltdown scheduled for this Saturday March 24th. "With the amount of rain and snow that has fallen the past couple weeks, It would have been nearly impossible to create a safe, smooth, and racy surface for our competitors", said New Egypt Speedway's Joey Liquori. "We don't want to see people tear cars up for no reason so early in the season." The focus now turns to the following Saturday March 31st when New Egypt Speedway will be hosting a free to the public practice session from 12-4PM. Pit Gates will open at 10:00AM for Tech Inspection and Practice will run from 12PM-4PM, any racecar that is New Jersey legal is welcome to take part in the practice session. Pit Admission will be $25. One twist to this years practice session. Whoever sets the fastest time in their division throughout the day of practice will receive a guaranteed redraw spot on their division's opening night. New Egypt Speedway will kick-off its season on Saturday night April 7th when Oliver Communications Group presents the return of the Modifieds who will compete in a 40-Lap Double Points affair along with the Northeast Wingless Sprint Cars, Sportsman, Crate Modifieds and Lyons Construction/Metal Fab Rookie Sportsman. New Egypt Speedway is located on Route 539 in New Egypt, NJ just minutes from Six Flags Great Adventure and the New Jersey Turnpike. A racy 7/16-mile D-shaped dirt oval, New Egypt Speedway serves Garden State race fans with some of the best competition in the country. New Egypt's state-of-the-art facilities feature daylight-quality lighting and excellent sightlines from any seat in the house. The grandstands are fully wheelchair accessible with wide, clear, and well-groomed walkways. Concession facilities serve up everything from Jersey Burgers to ice cream treats at family-friendly prices. For more information on New Egypt Speedway, visit online: www.newegyptspeedway.net, "Like" us on Facebook at www.facebook.com/newegyptspeedwayofficial, or follow us on Twitter @nesspeedway. New Egypt, NJ – For the first time since the year 2000, Monster Trucks are invading the New Egypt Speedway when the Monster Truck Racing League Monster Truck Schools Out Summer Smash comes to the Ocean County, NJ D-Shaped oval on Saturday and Sunday June 23rd & 24th. 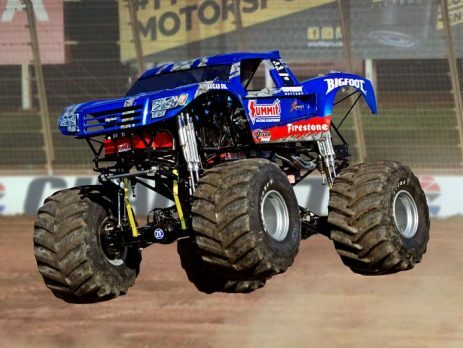 Headlining the field will be the Monster Truck that started it all, the one, the only, the legendary, Bigfoot along with Snake Bite, Equalizer, Viper and more who will all be looking to topple the original Monster Truck! Trucks will be competing in both Racing and Freestyle competitions. The car-crushing, truck-tumbling action will be sure to keep fans on their feet! In addition to the Monster Truck Madness, Freestyle Motocross will round out the card! Monster Truck Rides will also be available throughout the weekend for just $10. Advance tickets are on sale now at https://www.eventbrite.com/e/new-egypt-speedway-schools-out-monster-truck-summer-smash-featuring-bigfoot-tickets-42046082966. Adult tickets are $20 and Kids (4-12) tickets are $10 if purchased in advance. Kids 3 & under are FREE. There is a Family Four Pack (2 Adults & 2 Children) that is only available online in advance for $50. It all goes down on Saturday and Sunday June 23rd & 24th, 2018! Gates will open at 5:30PM on Saturday with a pre-show meet and greet from 5:30-7PM with the show beginning at 7PM. Gates will open on Sunday at 1:30PM with a pre-show meet and greet from 1:30-2:30PM with the show beginning at 3PM. 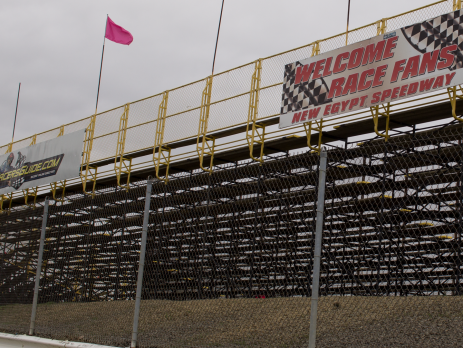 New Egypt Speedway is located on Route 539, minutes from Six Flags Great Adventure and the New Jersey Turnpike. For more information, call the raceway at (609) 758-1900 or visit their website at www.newegyptspeedway.net.